Sponsors Fischer, Craft, Мегафон, Adidas, Leki, Anschutz. Olympic champion 2014 in the relay race, bronze medalist of the 2010 Olympic Games in relay race, world champion 2017 in relay race, six-time medalist of world championships. 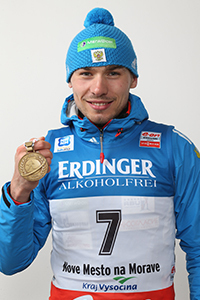 The owner of a small World Cup in the standings of the mass start (2014-2015). Absolute champion of Europe among juniors 2008. Two-time winner of the Champions race in the mixed relay, two-time winner of the Champions race in the mass start.